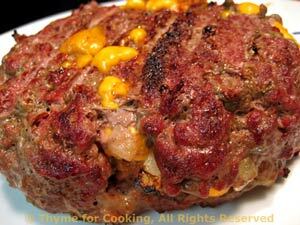 Grilled, Stuffed Burger, easy summer grilling recipe. You could make smaller burgers, but we like this big one. Cut into wedges, with cheese oozing out of the center.... Serve with or without extra ketchup. Chop onion and sauté in olive oil in nonstick skillet over medium-high heat until golden, about 7 minutes. Oil grill basket or baking sheet. Divide beef in half. On plates or waxed paper pat each half into a thin patty, about 6 inches in diameter. Put the 'bottom' patty in the grill basket, pan or on the baking sheet. 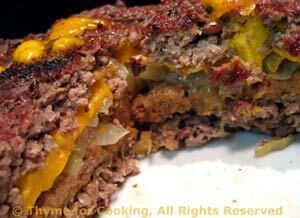 Mix bread crumbs, ketchup, soy sauce, mustard and garlic powder and immediately spread over 1 patty to within 1/2 inch of edge. Flatten the second patty a bit more and carefully put it on top and work the edges together with your fingers to seal. If using the barbecue grill for 8 - 10 minutes over medium-high heat, carefully turn and grill another 8 - 10 or until done. If using oven bake at 400F for 35 - 40 minutes or until done. Hint: when cheese starts oozing out the edge I consider it done. Remove to platter, cut into wedges and serve.